The return of Red Racken | Cricket Crazy!!! One stormy night, Tintin and Captain Haddock along with Snowy were going on a voyage when a large tornado was coming towards them. The ship crashed on a rock and Tintin, Snowy and Captain Haddock were thrown overboard.They were trying their best to swim but the waves were too strong for them and took them back. They almost gave up when they saw an inhabited island. This was surely going to encourage them to swim. Unfortunately, this didn’t work. They became unconscious. Luckily, they were carried away on the shore After an hour or two they gained consciousness but they heard someone’s footsteps so they hid behind a tree. Tintin saw Red Racken but Snowy saw him too and recognized him. He started to bark and unfortunately all of them were caught. Red Racken decided to kill them all with a nuclear bomb. On one end, he finished making the bomb and on the other end Tintin was making use of his knife to cut the bars of the window. Fortunately, the bars were weak enough to get cut from a really very sharp knife. ( Even sharp swords get it difficult to cut jail bars !!!) Tintin had already thought of a plan. Captain and Snowy will make a distraction to the security while Tintin will get the motor boat. Instead Captain rang the alarm and all the security guards arrived in the command room. Now it was easy for Tintin to steal the motor boat as the was no security. Tintin arrived at the Northern coast of the island as decided. After a few minutes Captain and Snowy arrived and sat on the motor boat and off they went. 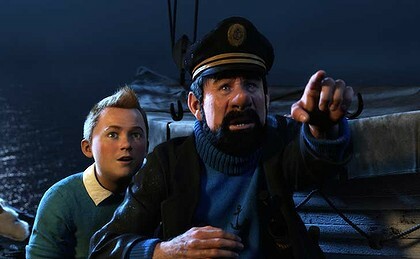 Captain Haddock asked what to do about Red Racken. Tintin just told that they had taken the motor boat so Red Racken can’t escape. There was a large sound like explosion after a few minutes. The bomb had exploded as the timer went 00:00. Captain came to know everything. Whatever about Captain but our little cutie Snowy also understood that they wouldn’t meet Red Racken again !